Mira is a red star in the constellation Cetus. It is a variable star, meaning that its brightness changes over time. While there are some indications that its variable nature was known in ancient times, the earliest reliable documentation of its variability comes from the late 1500s. By the mid-1600s, astronomers had determined that Mira’s brightness varied over a period of 333 days. The name Mira is Latin for “wondrous”, and so Mira is indeed a wondrous star. We now know that Mira is a binary star. The companion star, Mira B is a white dwarf, while the primary star Mira A is a 6 billion year old red giant star. Its mass is a bit more than that of our Sun, so in many ways looking at Mira A is glimpse into the future of our own Sun. That’s because Mira is a Sun-like star that is reaching the end of its life. Mira was just the first star of its kind to be observed. We now know of more than 6,000 similar stars, which are known as Mira variables. Another Mira variable is the star Chi Cygni. This was discovered to be a variable star in the late 1600s, with a period of about 400 days. We now know its period is 408 days. Recently we have even been able to image the star. 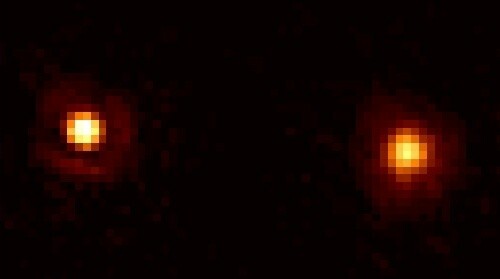 The Infrared Optical Telescope Array (IOTA) has used interferometry data from two telescopes to create infrared images of Chi Cygni. Over its variable period they observed the star swell and contract, as you can see in the image below. You can see a movie of its variation over seven years here. 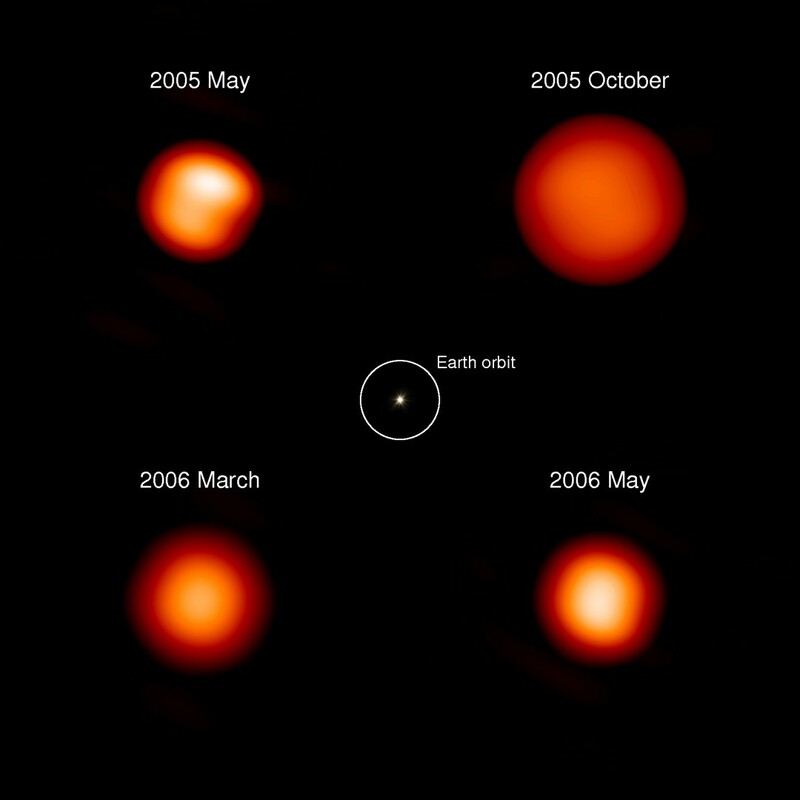 This confirms that Chi Cygni is a star on its last leg. This Sun-like star has nearly exhausted its hydrogen fuel, and so its rate of energy production slows. The resulting drop in heat and pressure in the star allows gravity to compress the star further. This drives up the temperature and pressure in the star enough to allow fusion to continue for a bit, but the resulting heat and pressure causes the star to expand. The central temperature of the star drops, and the star again stops fusing hydrogen. Then gravity collapses the star again, and the cycle repeats itself. Eventually there will be no more hydrogen to fuse, and not enough mass to drive fusion of higher elements, and the star will collapse to a white dwarf. For now we can observe Mira variables such as this to see how Sun-like stars end their days. At least for a few billion years when our Sun becomes a wondrous star. I think there is an error in your error caption. It seems to depict Chi Cygni but the caption calls it Mira. There is also an error, error in my comment. error.